My favorite Christmas present this year is the Cleveland Independents Deck. I can’t wait to start using it. The Deck looks like a deck of playing cards and contains 52 $10 coupons for lots of Cleveland Independent restaurants. Imagine being able to save $10 at 52 of your favorite, locally-owned Cleveland Independents restaurants. Each card in The Deck features a $10 special offer from some of Northeast Ohio’s favorite restaurants. No wonder The Deck is ideal for corporate gift-giving or for anyone who loves to explore the area’s many diverse, local flavors. 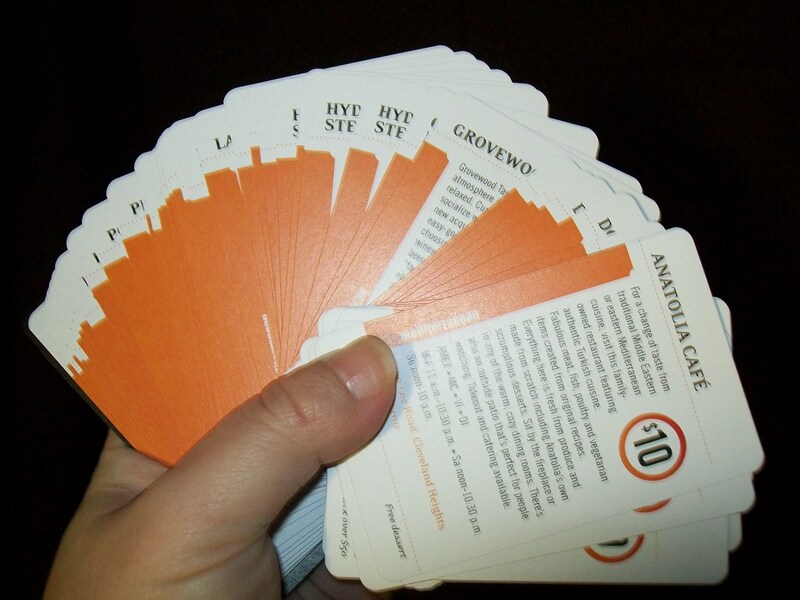 * Each card includes the restaurant’s location and phone number. * Each card is easy to redeem. Present it to your server. It’s that simple! I promise there will be plenty of posts on the way this year with the help of The Deck. I can’t wait to try Ponte Vecchio and Bistro 185 as well as revisit personal favorites like The Mad Greek, L’Albatros and Luxe Kitchen. If you want your own you can order it here.